Posted October 12, 2013 at 7:30 p.m. TROY HARVEY/THE STAR Rebecca Limon talks about her brother Alfonso Limon Jr., who was shot and killed in La Colonia last year after Oxnard police officers mistook him for a suspect. 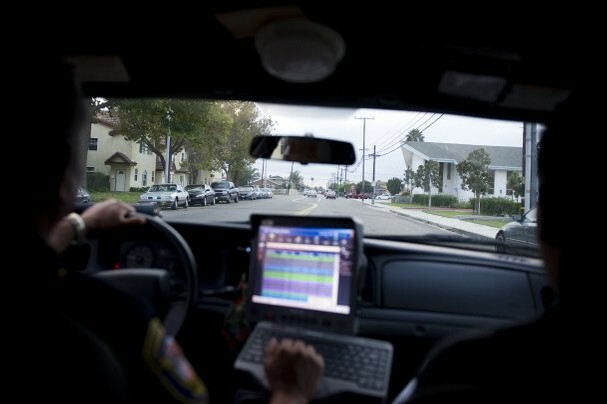 Reporter Gretchen Wenner and photographer Troy Harvey rode along with an Oxnard police sergeant on patrol in La Colonia on Tuesday evening, as reporter Cindy von Quednow and photographer Rob Varela simultaneously walked the neighborhood, talking to residents. Yellow tape choked off the shooting scene. But a neighbor let Rebecca Limon and her sister through a front yard. From there, they could see the body. It was covered. Only the tennis shoes were visible. It was a year ago, on the night of Oct. 13, 2012, that Alfonso Limon Jr. died. Police say they shot the 21-year-old after mistaking him for a suspect. A traffic stop in Oxnard’s tough La Colonia neighborhood had turned chaotic and violent, with two fleeing men reportedly firing at officers. One suspect was killed, another injured. Nine officers fired weapons. The Limon shooting roiled the community, inflaming tensions among those who’d already organized protests over police-related deaths in the city. They claim ongoing brutality and harassment in low-income, heavily Latino neighborhoods. Today, the public remains largely in the dark about what happened that night near the southeast corner of Garfield Avenue and Cooper Road. Few official details have been released. 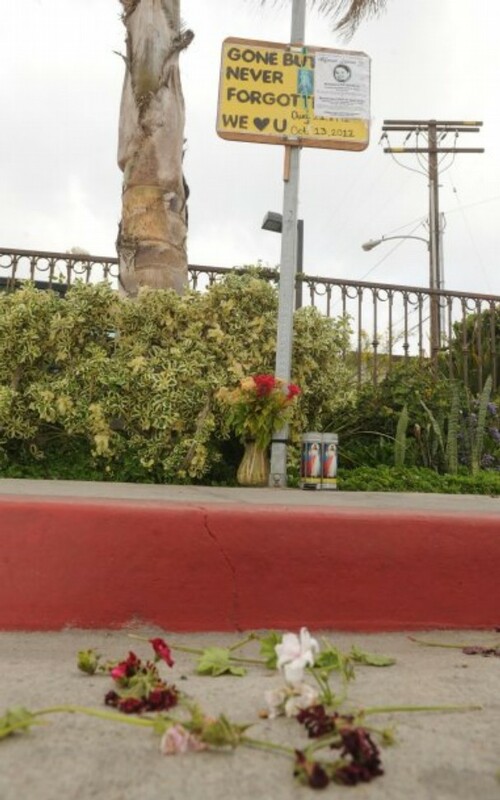 ROB VARELA/THE STAR The street bears wilted flowers near a memorial for Alfonso Limon Jr., who was shot and killed by police who mistook him for a suspect last year in Oxnard’s La Colonia neighborhood. 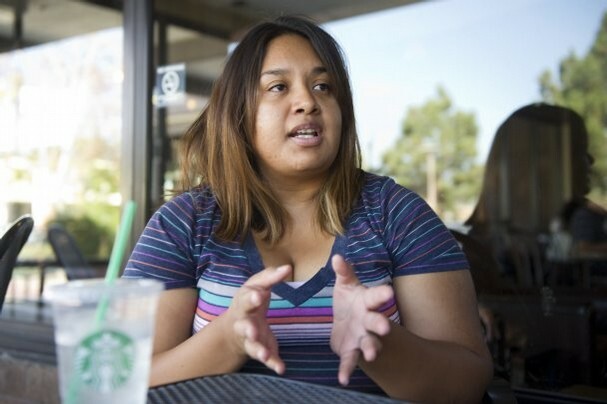 Starbucks in Camarillo, glancing toward her 7-week-old son asleep in a carrier. But the family has seen no autopsy results, no ballistics reports. “There’s no way of moving on, not knowing how many times he was shot, if he bled to death or what caused his death,” she said. Since February, when the names of the nine officers were released, the family has had no updates. 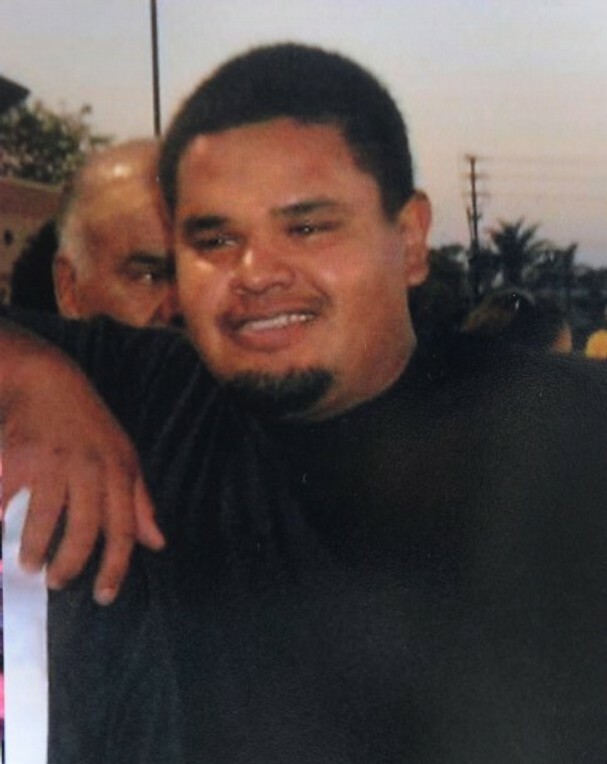 A single-page county death certificate says Alfonso Limon was “shot by police officers with rifle and handguns.” He died on the street within minutes. The county medical examiner’s reports have not been publicly released, nor have results of investigations by the sheriff’s and district attorney’s offices (see related story). Last year, the date fell on a Saturday. The incident unfolded shortly after 10 p.m., when a traffic stop went bad. Alfonso Limon was walking home with younger brother Gerardo after jogging nearby, according to a federal lawsuit filed by the family. The Limons live a few blocks from the scene. The suit claims that when Alfonso Limon was mistaken for a suspect and surrounded by police, he put his hands up and yelled, “Don’t shoot, don’t shoot,” before they fired. Bullets barely missed his brother, who ran across the street to safety, it says. In August, the family held a birthday party for the dead man. They made his favorite food — spicy chile verde — and had a cake with candles, but no one to blow them out, Rebecca Limon said. She said he was a big-hearted jokester who loved spooking his three older sisters while growing up in their creaky house. He was the oldest of three boys and loved hanging out with his friends. Everywhere he went, people knew him. He and Gerardo — Gerry, she calls him — were inseparable, and Gerry hasn’t been himself since. Members of the family don’t believe the entire Oxnard Police Department is bad, Rebecca Limon said. But they want the officers involved in her brother’s death to be held accountable. TROY HARVEY/THE STAR Police Sgt. Alex Rangel, who has 20 years with the Oxnard Police Department, patrols Oxnard’s La Colonia neighborhood, where he once worked as a storefront cop. “In the beginning, we knew that there was an uneasy feeling within the community,” Rangel said of the atmosphere after the Limon shooting. 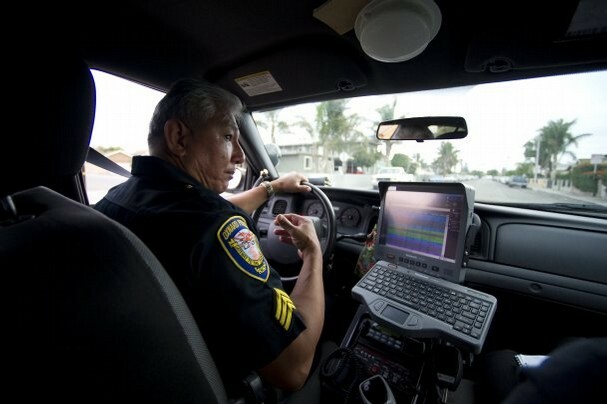 Oxnard police Sgt. Alex Rangel figures he has thousands of mental files on residents in the district he oversees, which includes La Colonia and adjacent Rose Park. Those files came in handy when Rangel spied a yellow motorcycle with no headlight on Cooper Road shortly after dark Tuesday. The driver had no license, ID, registration or insurance. Rangel spoke to him in Spanish. A licensed driver was allowed to fetch the bike and walk it home, and the man who was stopped walked away with a citation. When asked how he knew the information the motorcyclist provided was accurate, Rangel said he recognized him from a certain apartment complex and that the address he provided matched up. As he patrolled streets and alleys before sunset, children in brightly colored shirts gave friendly waves from doorsteps and parking lots. Men who’d gathered on some sidewalk corners threw stony stares. TROY HARVEY/THE STAR Sgt. Alex Rangel patrols Oxnard’s La Colonia neighborhood Tuesday evening. cop in La Colonia. He still stays in touch with the streets. He has eaten at every restaurant in the neighborhood, he says. He and his officers watch Little League games. They work with nonprofits, faith-based groups and schools. Outreach is unofficial, as well. Police have provided clothes and haircuts for children so poor, they’re embarrassed to go to school. They’ve donated sports equipment to teams. Recently, the story of an officer who replaced a little girl’s stolen bicycle went viral nationwide after the mother posted a thank-you message on the department’s Facebook page. On Tuesday evening, Rangel dropped by a Rose Park neighborhood watch group’s meeting. Member Manuel Cano said the group has been meeting for nearly 13 years and an officer stops by every time; he called the department wonderful. Rangel later visited a monthly workshop for the indigenous Mixteco community. “In the beginning, we knew that there was an uneasy feeling within the community,” Rangel said of the atmosphere after the Limon shooting. He was not working that night. As with any critical incident, whatever people think of police — positive or negative — gets amplified, he said. The department launched its community policing strategy in 1994, and it remains in place now. The patrol structure has not changed as a direct result of the Limon shooting. New outreach programs, such as a Spanish-language citizens academy, were already in the works, Rangel said. Rangel said he compliments the group for exercising its rights. 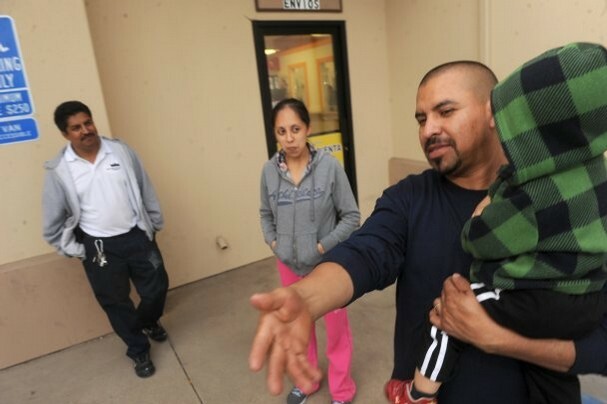 ROB VARELA/THE STAR Andres Castro holds his son Andres Jr. in Oxnard’s La Colonia neighborhood on Tuesday. Castro and his wife, Esperanza Gonzalez (center), live in an apartment near the corner where Oxnard police officers shot and killed a man they mistook for a suspect last year. Rigoberto Gonzalez (left) is part owner of the building. Rigoberto Gonzalez, 39, is part owner of the building at Cooper and Garfield where Alfonso Limon and suspect Jose Zepeda, 24, were fatally shot. He rents space to several businesses there. On the night of the shooting, his green Honda Accord was parked in the adjacent lot and became riddled with bullets. Extensive bullet holes in the building required insurance company involvement to patch. “They shot up the whole car, they shot upstairs, for no reason,” Gonzalez said. Sheriff’s deputies, who were called in by Oxnard police to investigate, took security cameras from his building, promising to return them. They never have, he said. “That drove me to think that I can’t trust them,” he said of law enforcement officers in general. Gonzalez grew up in La Colonia and has spent his life in Oxnard. He still feels safe there. But people want to know the truth about what happened that night. “We just want a little bit of respect and feedback, but no one has really explained anything,” he said. His sister Esperanza Gonzalez, 29, lives with her family in a second-floor apartment in the building. For days after the shooting, women would weep at the site where one of the men died, where a bloodstain darkened the pavement, she said in Spanish. Their wails could be heard from the family’s apartment. Her daughters, who were 9 and 4 at the time, are still shaken up by the incident a year later. They often want to run upstairs to the safety of their apartment when they return home. Gonzalez had come home with her husband and children and was putting away groceries when bullets started flying downstairs. “What would have happened if we would have gotten home 10 minutes later?” she wondered aloud. 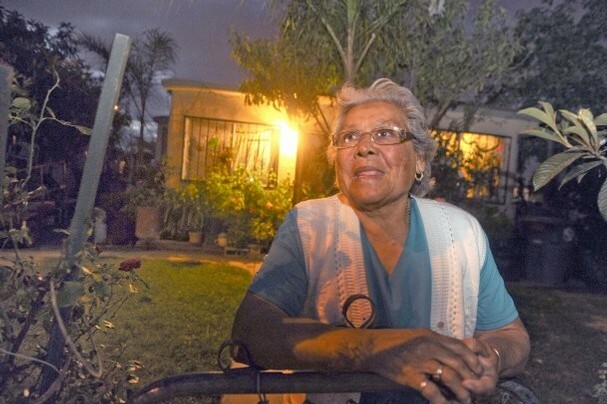 ROB VARELA/THE STAR Alberta Paramo stands in her front yard across the street from where Alfonso Limon Jr. was shot by police in Oxnard’s La Colonia a year ago. Alberta Paramo, 84, was getting ready for bed when she heard the shots outside. She mistook them for fireworks at first and had to think about what was being celebrated. But there was nothing to celebrate. She has lived on Garfield, across the street from where the two men died, for more than 20 years. Since that night, it seems to her there have been fewer officers around. She prefers it that way. “It’s as if the law retired,” Paramo said in Spanish, sitting in her living room, a large portrait of the Virgin of Guadalupe hanging on her wall. Paramo wonders about the things she saw. Why did police continue to shoot a man who was already lying facedown on the ground? Why did authorities chop down a large tree near the shooting site days later? “It shouldn’t have happened,” Paramo said of the ordeal. Not far from Paramo’s home, Antonio Rodriguez, 30, waited for clothes to dry at a neighborhood laundromat. He wasn’t home that night but remembers his wife giving him the news. “She told me later that they killed an innocent man — someone like me,” he said in Spanish. Oxnard Police Chief Jeri Williams in an email Friday repeated sentiments she has expressed previously: The Limon incident was a tragedy for the family, community and department; the suspects created the situation; she extended her condolences to the Limons. This entry was posted in Brutalidad Policial // Police Brutality, En Las Noticias // Media Coverage. Bookmark the permalink. All of the stories about OIS unfold the same way and come to the same end. The cops say “oops” . They investigate themselves. They “find” themselves justified. They don’t release any details. They cover themselves up with their blue blanket of officialdom. The first thing they do is lawyer up. Then they accuse the dead person of threatening them. Then they dig up dirt on the dead person. They treat the dead persons family like criminals. Protect and serve? Oh. And they deflect blame for their incompetence on others. ” the suspects”. My heart goes out to this young man and his family. I can’t imagine what Alfonso Limon’s little brother Gerardo must’ve felt being forced to witness such a horrific crime against his big brother. What he still must be feeling and going through. I pray this family finds peace. I hope for justice for Alfonso Limon. Regardless of the circumstances surrounding the fatal shooting of this innocent young man, those so called “law enforcement officers” aka murderers with badges had no reason to fire their weapons at him. This was a cold blooded murder.